New England's coolest potholes are no mere pits in the pavement. 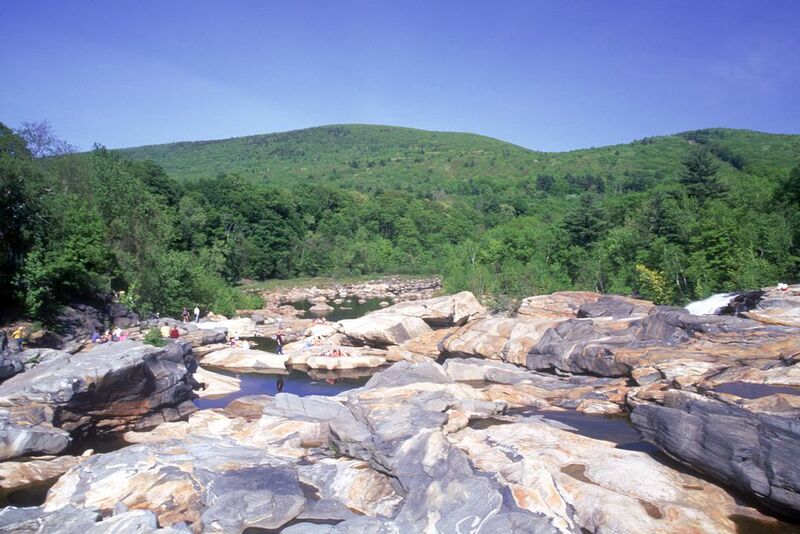 Shelburne Falls, Massachusetts, is home to glacial potholes. These natural outdoor "pools" were several hundred million years in the making. How fascinating to contemplate the fact that the last Ice Age left behind a free attraction that's still one of the reasons travelers turn off the Mohawk Trail to explore this little village. You'll find the Glacial Potholes right in the heart of the village at the end of Deerfield Avenue. They are just a short walk from the Bridge of Flowers: another Shelburne Falls must-see. Can You Go Swimming in the Potholes? There's so much old-fashioned mystique to the notion of cooling off on a sticky, steamy New England day by taking a dip in a "swimming hole." And the glacial potholes in Shelburne Falls are as old-fashioned as you can find. But... don't get your hopes up as you can't go swimming. That wasn't always the case, and many years ago, it was common to find dozens of people sunning themselves on the rocks and cooling off in the shallow, glacier-carved swimming holes at the base of Salmon Falls on the Deerfield River. The glacial potholes were, however, closed to swimmers in 2002. Now, people being people... there are still a few folks who manage to find their way down onto the rocks. But reports like this indicate that there's a really good chance that local police will shoo you away if you attempt to access what was once a natural water amusement park. Are the Potholes Worth Visiting Anyway? Of course! You can still view the potholes and take pictures. The shadings in the ancient granite caused by the swirling of water and stones as the glacial age began to "melt down" are a picturesque geological sight. There are more than 50 potholes to see, ranging in size from 6 inches to 39 feet in diameter. This is one of the largest known concentrations of potholes and the location of the largest pothole on record, as well. There is no charge to observe the potholes from a viewing platform. Water levels may vary based on weather conditions and operation of the dam, so you may see tranquil pools or a rushing waterfall.